"Possibilities. Give people what they want." Your first impression of Joe Boyden might be his easy gait, relaxed demeanor, and calm approach to life. Those characteristics are all right on the money, but what lies beneath the surface is even more inspiring. This extraordinary custom homebuilder has been defining and refining his home building skills for more than three decades. Like a finely trained athlete, Joe started from the ground up, working in the field from the age of sixteen. Still in his teens and younger than most of his employees, Joe built town home developments, erected private greenhouses, and worked as a framer against well-known and well-funded competitors. At the age of 21, he was the "go to" contractor for both simple and complex projects. For example... a perfectly designed and built spiral staircase? Call Joe. No other builder or carpenter could compete. Today, Joe has grown his company, Homes by Joe Boyden, into one of New Mexico's premier home designers and builders. 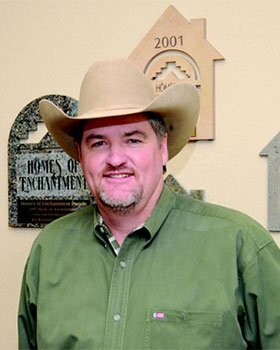 Based in Tijeras, New Mexico, twenty miles east of Albuquerque, Joe continues to personally oversee construction from start to finish of nearly 100 homes per year. It's a reflection of his dedication to each and every customer, and a testimony to his commitment to a job well done. As Joe says, "A lot of builders forget to finish. We ARE finishers!" Homes by Joe Boyden has succeeded in building beautiful homes and lasting relationships over the years because of the philosophy embraced by Joe Boyden and his team, that because all families are unique, with different needs and personalities, every home should reflect that individuality inside and out... today, tomorrow and for years to come. Clients are offered a wide array of choices when it comes to customizing home plans. Common modifications include the enlargement of master suites, the addition of covered patios, window or door relocation and additional fireplaces. "Flexibility is the name of the game when designing and building," says Joe. Buyers can observe the construction of their home from start to finish via an Internet connection, with updated videos of both the interior and exterior every two weeks. Standard Homes by Joe Boyden features include ceramic tile flooring, vaulted ceilings, wood trim, granite slab countertops, walk-in pantries, glass shower enclosures, garden tubs, arched doorways, interior beams, his and hers closets in the master suites and oversized garages. Current projects include an historic renovation on the Plaza in Santa Fe, a romantic community with dramatic homes along the Rio Grande River in Bernalillo, and elegant homes lining the fairways at Turtleback Mountain Resort in Elephant Butte, New Mexico.